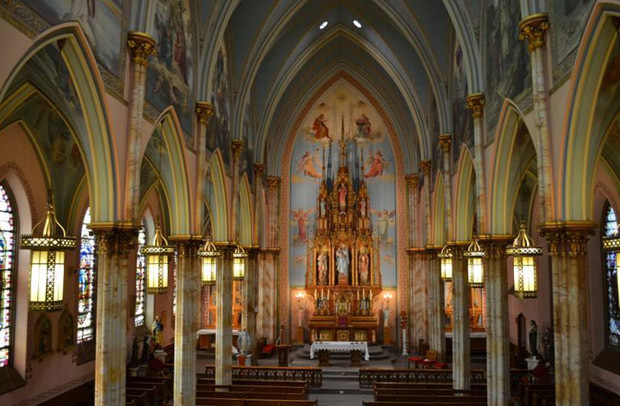 The 130-year-old St. Laurentius Church in Philadelphia’s Fishtown section will be demolished, the archdiocese announced Sunday, March 22, after the news was communicated during the three weekend Masses at Holy Name of Jesus Parish. St. Laurentius Church had been designated a worship site after it merged with Holy Name in July 2013, but has been closed since last March due to the danger of its collapse. The imposing brownstone structure with its twin copper-clad bell towers has dominated the North Philadelphia neighborhood since it was built in the 1880s by the Polish Catholic immigrants who settled, worked and worshiped in the area more than a century ago. Perhaps even more impressive is the church’s interior, with its decorative altarpiece, high columns and ornate painted ceilings. But time, the elements and financial circumstances have not been kind to the beloved church. Not only did falling stones from the church’s façade necessitate netting and a platform over the sidewalk to protect passersby, but an engineering study by O’Donnell and Naccarato identified the extent of the deterioration. One of the massive towers leans six inches off center, daylight can be seen through missing stones from the interior, chunks of the brownstone have fallen away from the façade and long vertical cracks in the masonry run through several areas of the building. Photos in the study showed the extent of water infiltration and the damage done to the structure. Although Fishtown has seen somewhat of a rebirth through gentrification in recent years, the neighborhood that once teemed with Catholics who could provide the level of financial support necessary to repair and maintain the huge church can no longer do so. 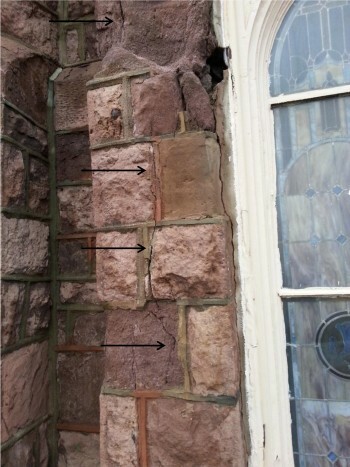 A detailed view of the exterior of the church shows the deterioration and vertical cracks of the brownstone facing stones. At the time of the 2013 merger, statistics showed that both Holy Name and St. Laurentius together welcomed only 602 Catholics for weekend Masses in 2011, down from a combined 825 just four years earlier. Even though St. Laurentius had a few more attending (326) in 2011 than Holy Name (276), even the merged parish of Holy Name was able address the extensive and expensive needs at St. Laurentius Church due to years of deferred maintenance. The study noted that the harsh winter of 2013-2014 was especially hard on the church and the freeze-thaw cycle exacerbated its water infiltration problems, resulting in more damage to the masonry. Since the merger of the two parishes, the task of deciding what to do with St. Laurentius Church fell to Holy Name of Jesus’ parishioners. They mulled three options presented by the engineering firm in February 2014: demolish the towers and rebuild them, rebuild their structural supports and renovate the rest of the church, at a cost of almost $3.5 million; demolish the towers and perform the other renovation work, for almost $2 million; or demolish the entire church, for $1 million. Ultimately, Holy Name decided on the third option. As is the case with all merging parishes in the Archdiocese of Philadelphia, Holy Name assumed ownership of St. Laurentius Church in July 2013, so “the financial burden falls on Holy Name of Jesus Parish” to demolish the church, according to a statement from the archdiocese. 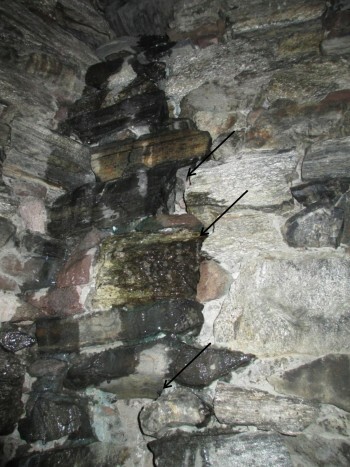 A view of the interior of the west tower of the church shows the path of water infiltration and the separation of the masonry. The demolition work is expected to occur over the next several months and “will be largely financed by the sale of unutilized parish property,” the statement said. 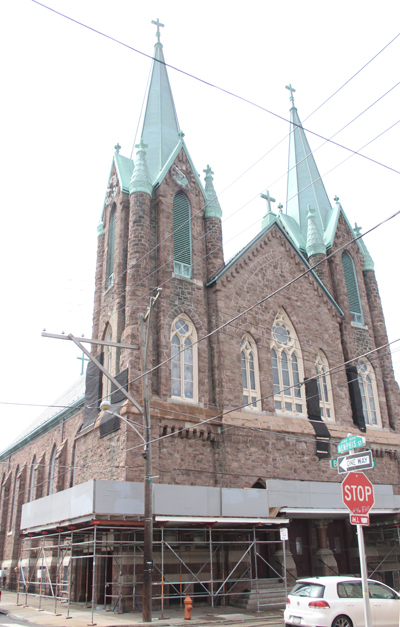 Holy Name’s pastor, Father John Sibel, arrived at the decision to demolish St. Laurentius Church along with the parish’s finance and pastoral councils, plus archdiocesan representatives, using the O’Donnell and Naccarato study. St. Laurentius School still operates within Holy Name Parish. In fact, according to a study by the St. Laurentius Home and School Association, student enrollment is increasing. Enrollment for the coming academic year is already at a seven-year high for the school, at 239. The archdiocese said there are no plans to close or sell the school. Isn’t there another side to this controversy? Don’t the St Laurentius people say that because it’s a steel skeleton building it’s repairable, and repairs will cost less than demolition?